If you’re looking for the best organic face wash but are worried about your dry, acne-prone, oily, or aging skin, you’ve come to the right place. There are a lot of great organic face washes out there so we researched the most popular brands and top-rated products to help you find the right one for you. Before we get started with our reviews, let’s take a quick look at some of the things you should keep in mind while you shop. Type: These products come in creams, gels, and thin gels or liquids. Creams tend to be better for dry skin and gels lather a little more but, honestly, what type you get really just boils down to personal preference. Made In: All of these products are made in the USA with one exception, which is made in India and uses natural ingredients sourced there. Some of these products do get their ingredients from other countries, though. Exfoliating: A few of these cleansers are also great for exfoliating and do it using all natural ingredients like willow bark or jojoba beads. Don’t worry, even the products that exfoliate are also gentle on your skin. Paraben-Free: Parabens were once used as a preservative but there is some evidence that they can lead to health problems, specifically breast cancer. So, that’s why it’s really important that all of these products are paraben free. Package Size: Package sizes can be a little deceiving because some of these products are pretty concentrated and work up into a good lather. You don’t always have to use a lot so a little really can go a long way. Fragrance-Free: First, we want to point out that none of these products have any added fragrance or perfumes. That said, they all have some sort of natural fragrance from the ingredients, which we noted in the reviews where we could. That’s all you have to know to figure out which is the best natural organic face wash for you. Let’s move into our reviews. Here’s the deal. If you’re in a hurry, we put our top and budgets picks right at the top of the list so you’re sure to see them. That’s the best way to see the range that’s available. These products are all very different, though, so stick around as long as you can. All right, let’s get started! Our top pick is a great choice for anyone but it’s also the best organic face wash for sensitive skin. Christina Moss Naturals Face Wash doesn’t contain any chemicals of any kind. It’s hypoallergenic and gently cleans your skin without drying it out or leaving behind and build-up. The 4-ounce tube might seem small but this formula is actually really concentrated and is equivalent to 8 ounces of other face washes. One of the great things about this brand is they make new batches of this product every week so you know you’re getting something fresh, not something that’s been sitting in a warehouse for weeks before you get it. It’s good for 6 months from the purchase date and you can return it for a full refund within that time if something isn’t right. 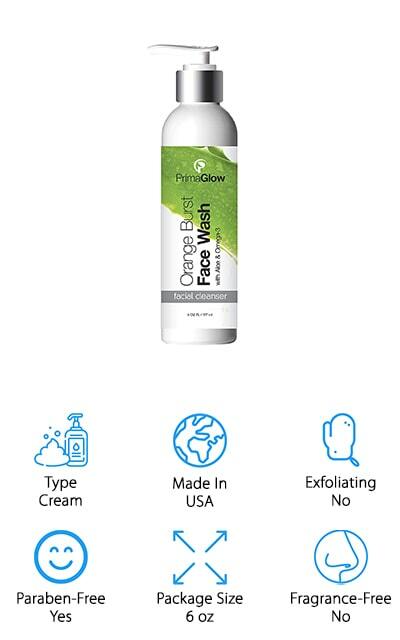 A great face wash to try out if you’re on a budget is the PrimeGlow Orange Cleanser. It’s gentle and effective without being abrasive and won’t strip away your skin’s natural moisture. This is a good choice for all skin types, including both aging skin and even acne prone skin. Why? Because it’s packed with nutrients and antioxidants your skin needs to stay moisturized as well as a natural salicylic acid to deep clean your pores. It also contains coconut oil and Aloe Vera to help treat any dryness and irritation. While it doesn’t have any added fragrances, it does have a sweet orange smell that comes from the natural essential oils included in the formula. In addition to adding a wonderful aroma, the orange oil also helps hydrate dry, wrinkled skin. 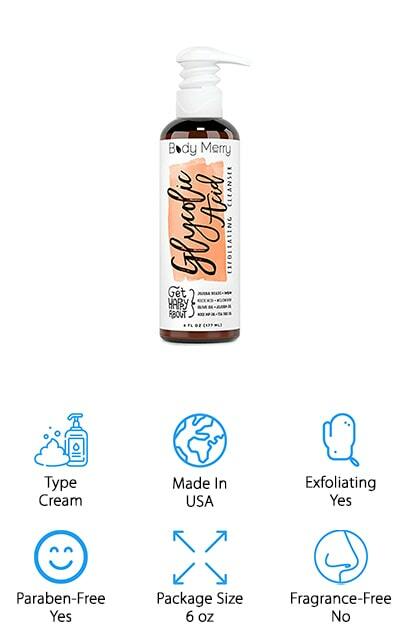 Another great choice is Body Merry Cleanser, an exfoliating cleanser that contains glycolic acid, willow bark, and jojoba beads to gently remove any dull dry skin cells and unclog pores. Other ingredients include Kojic acid, olive oil, rosehip oil, and tea tree oil. If you want something that will give you a really deep clean, this is it. It comes in a 6-ounce bottle with a convenient pump so it’s really easy to get just the right amount of product out with each application. The pump only distributes a little bit at a time but, don’t worry, that’s all you need! This cleanser is vegan-friendly, cruelty-free, and never tested on animals. Plus, it comes with a 90-day manufacturer happiness guarantee which means they’ll refund your money if you’re not satisfied for any reason. 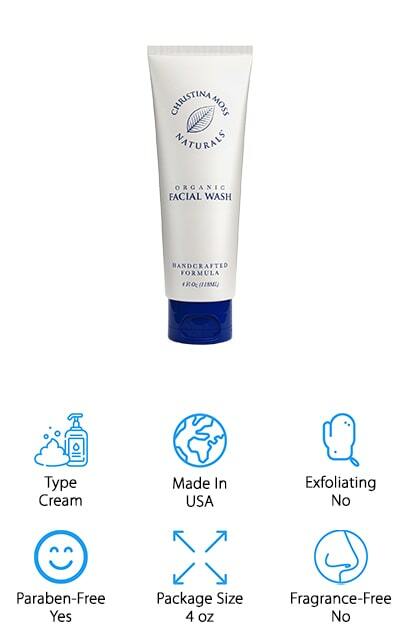 Next up is InstaNatural Facial Cleanser, a formula that contains only natural ingredients derived or made directly from renewable resources. This Vitamin C formula is packed with natural antioxidants and extracts including green tea, chamomile, and sugar cane to clean deep down into your pores as well as coconut water and aloe to leave your skin feeling refreshed and hydrated. It’s a balancing formula that’s great for any type of skin. This 6.7-ounce bottle will last quite a while, too, since you only need to use a small amount with every application. The high-quality ingredients are sourced from all over the world and manufacture them around in the USA in facilities that are FDA registered and GMP compliant. In other words, it’s verification that they use the highest possible quality standards around. 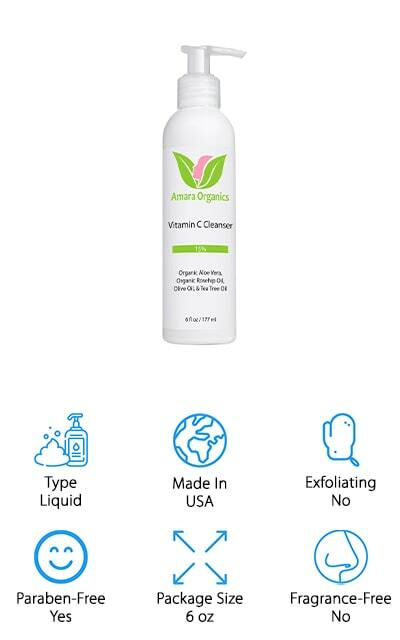 Amara Organics Facial Cleanser is the best organic face wash for dry skin that we found in our research. It contains 15% Vitamin C as well as moisturizing Aloe, rosehip oil, and tea tree oil and removes dirt, oil, and makeup, including mascara, without stripping away any natural oils or leaving your skin feeling tight or dry. This is a non-irritating formula that’s great for all skin types but because it’s so gentle, it’s perfect for sensitive, dry skin. Plus, it provides the kind of deep cleaning that acne-prone skin needs, too. If you’re not happy with it, there’s also a 100% money back guarantee, no questions asked, no returns necessary. One more thing, while there are no artificial fragrances added, it does have a light, clean smell that doesn’t linger after you rinse it off. 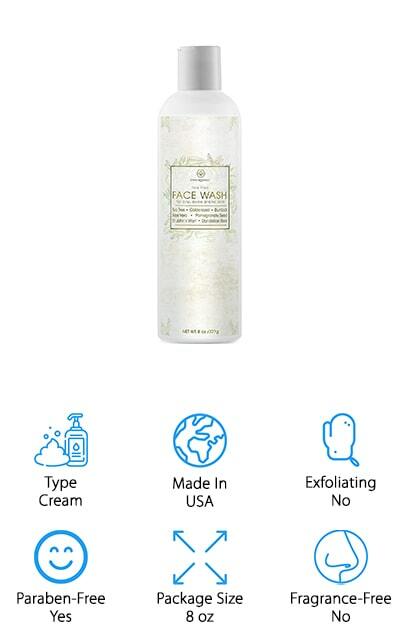 Another great choice is Era Organics Face Cleanser. It’s meant for any kind of skin, including acne-prone skin, chronic dry skin, and even for people suffering from rosacea. There are a lot of wonderful ingredients in this formula, including tea tree oil as well as goldenseal burdock root to help prevent acne flare-ups, aloe vera for deep hydration, and St. John’s Wort to help smooth and tone skin. Not only does this cleanser help balance oils, but it also cleans deep down to not only nourish your skin but also to take care of acne-causing bacteria. Something really impressive about this product is the company behind it. Era Organics is a family-owned company that really stands behind their products, so much so that this facial wash comes with a 60-day money-back satisfaction guarantee. 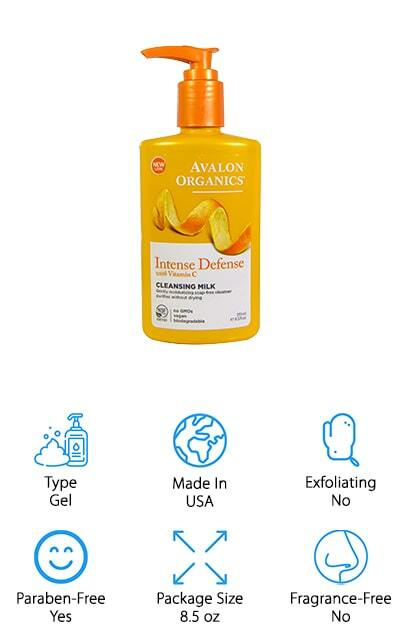 For the best organic face wash for oily skin, take a look at Avalon Organics Cleansing Gel. This large 8.5-ounce bottle is a certified-organic, plant-based formula that’s made with botanicals and essential oil. It also contains 2 different forms of Vitamin C. While there are no artificial fragrances added, this cleanser has a light citrus smell that comes from the natural ingredient which includes white tea and lemon. In addition to nourishing your skin, it’s also a powerful cleanser that can even remove makeup. The bright orange bottle comes with an easy-to-use pump that gives you just the right amount of cleanser. A little goes a long way so this bottle should last a long time with normal use. One more thing, this face wash is also vegan-friendly and not tested on animals. 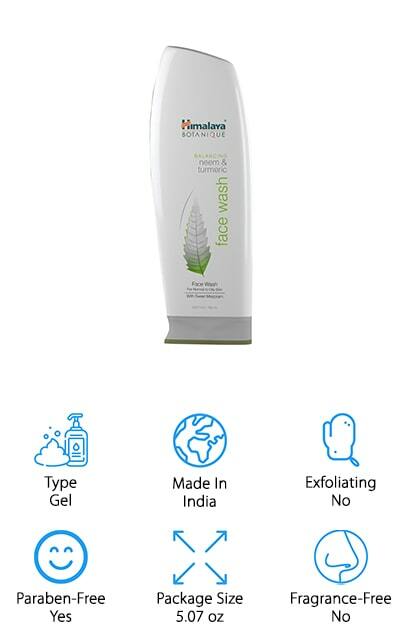 Our pick for the best organic face wash for combination skin is Himalaya Natural Face Wash. 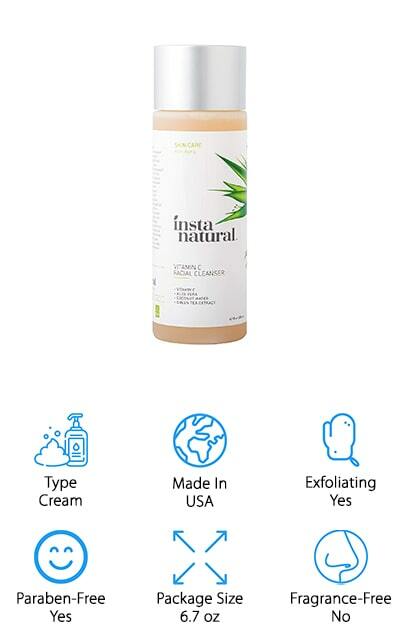 This formula need and turmeric, ingredients native to India that have been used medicinally for centuries and, since this face wash is actually made in India, it’s coming right from the source. While this formula is perfect for acne-prone, oily skin, it also has advanced hydration that’s great for normal or dry skin, too. It’s specially formulated to help even out skin and clear away impurities. This soap-free cleanser gets deep down into your pores to clean and hydrate. You don’t need to use much, either, because it works up into a pretty nice foam so a little really does go a long way. There are no added fragrances or artificial colors and Himalaya Botanique never tests on animals. Eavara Organic Facial Cleanser is formulated for aging skin. They use green tree extract for a boost of Vitamin E as well as coconut and tamanu oils to clean and moisturize. 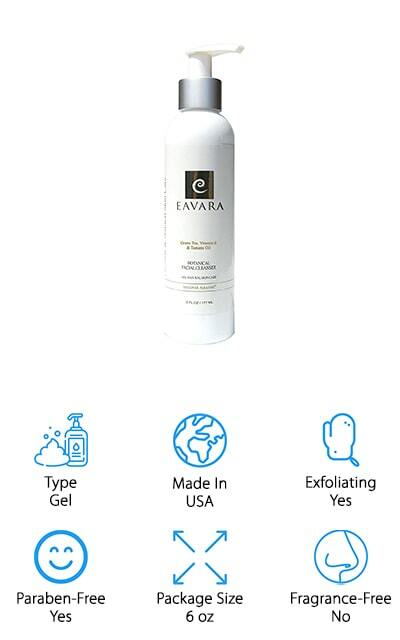 This Eavara cleanser is also a good choice for sensitive skin because it’s gentle enough to use every day to moisturize, hydrate, and exfoliate while being effective enough to remove dirt, oil, makeup, and even sunscreen. It’s formulated in Hawaii which is where all of the ingredients are sourced as well. While it might seem like 6 ounces isn’t very much, you really don’t need a lot so this bottle should last for a long time. In fact, they actually offer a forever guarantee so you can return the unused portion of the bottle at any time if you’re not satisfied. Last but not least is Essa Skin Care Cleanser. This is a perfect formula for all skin types and is gentle enough to use every day. With ingredients like sunflower seed oil, Vitamins A, B, C, and E, and an organic oil infusion, this all-natural cleanser cleans, exfoliates, and cleans deep down to fight acne and rinses away clean without leaving behind any residue or tightness. That’s not all, it’s also safe for people suffering from rosacea and eczema as it won’t dry out your skin. 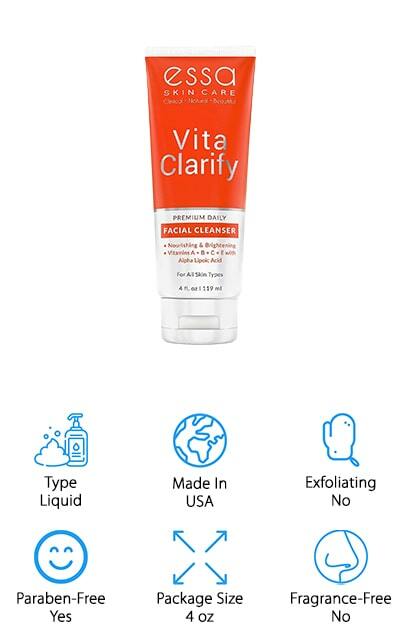 Although there are no artificial fragrances added, this cleanser does have a natural light orange smell that isn’t overpowering. This 4-ounce bottle has an easy-to-open lid so you can squeeze out exactly what you need for each application. Because it works into a nice lather, you don’t need to use a lot.